As promised, the following is the conclusion to a two part series on morning sickness cures. The first post is geared towards morning sickness tips that will make your first trimester wonderful. If you haven’t read the first post, go ahead and read it here. This post will cover the best foods for morning sickness relief. Let’s get started! 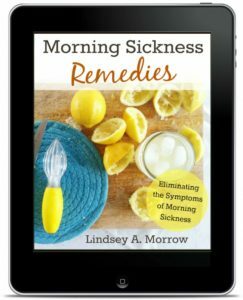 My readers and friends have been so kind with all their suggestions for the best foods for morning sickness relief. Just as it takes a village to raise a child, it takes a village to help a woman through the plight of “morning” sickness. Feel better soon by eating the best foods for morning sickness. The right foods make all the difference during the early months of pregnancy. Without any further rambling, here is a list of the best foods for morning sickness relief! It’s so important to stay hydrated and meet the daily water intake requirements for pregnancy! Remedies may work for a time, and then later on not so much. Keep trying new things until you find what works. Change it up when it stops working. There you have it! Wasn’t that a helpful list of some of the best foods for morning sickness relief? During my first 12 weeks I sucked on peppermint life savers whenever I felt nauseous and they were great!! Indeed, lemon and ginger are the best and effective remedy for morning sickness. Apart from these two peppermint candy is another useful stuff in fighting with morning sickness. Some people prefer it as with tea but you can also take it with candies. You can also try peppermint tums which contains high concentration of pepper mint oil in it. Pepper mint oil is highly effective as compared to candies or tea, also it is portable and quite inexpensive at the same time. Apart from taking these cures its better to take advice from the doctor and from online websites. I did not have a lot of vomiting during early pregnancy, but I certainly had very horrible nausea and food aversions, especially when smelling or thinking of certain foods. In general though, I’m just not much of a Puker. I can say though, that there are a few things that helped me get through the nausea. Vitamin B6 and Unisom combo for sure (it is important to take this consistently every 4-6 hours for it to have the best effect; 25 mg b6 and half a unisom tablet), waking up a little bit earlier than usual and eating a small bowl of plain raisin bran with almond milk, and also drinking a glass of Metamucil Right before bed kind of helped me to not be starving in the morning, which was one of the reasons I would often feel extra nauseous. Everybody has different things that seem to help them, and these were mine. I am suffering terribly with morning sickness. Iv only been sick once but the nausea is all day every day. And i have another 3 weeks until the 12 week mark where im hoping it will disappear! Im struggling to find foods i like. I am put off all foods i used to eat all the time. Im finding it very hard. This is my first pregnancy so its all new to me.